Today I have a simple way to glam up your dinner party table setting…vintage place card holders. When I was a little girl I always thought the word “Hospitality” meant something about going to the hospital. It sounded scary. My thoughts were re-enforced by the fact that every time my parents entertained, my Mom got very uptight and sick with worry. Now that I am older, I laugh at that childhood notion, but wonder why a lot of people hesitate to entertain and suspect that I wasn’t the only one who had those scary thoughts. Now, many years later, having many successful parties (more party ideas in my Entertaining Gallery) under my belt, I have taken the word “hospitality” out of my vocabulary I have come up with a new, better sounding term for festive and stress -free entertaining. I call it – Festpitality. It is a way of entertaining that doesn’t require anti-anxiety pills or hours of preparation – Just fun, simple, imaginative, yet elegant ways for having a good time with family and friends. The first of course is to keep it simple. These vintage place card holders certainly fit the bill. They are literally a snap to make. Open the earring back and place the card in. Snap shut. Set on table. Repeat for each place setting. I like to use a different earring for each place setting. It adds more color and character to the table. The best part is after the party – they can be put right back into your jewelry box – no worse for the table wear. 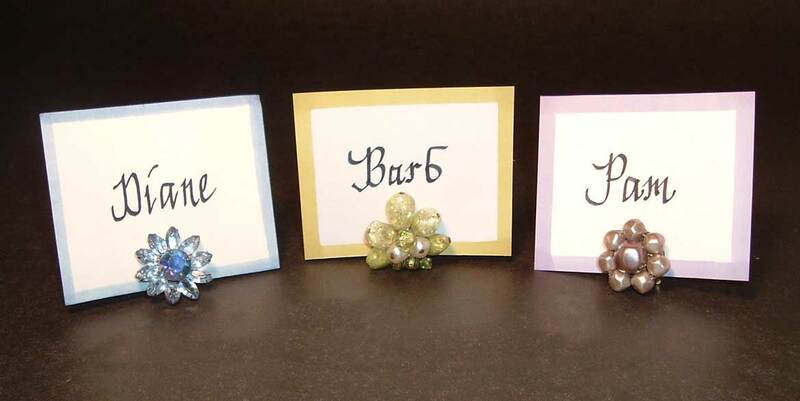 I made the place cards simply by writing the names of my guests on card stock. If you would prefer to print them out on your computer, here are some of my favorite free fonts. I used a magic marker around the edge to create the colorful border. Very Cute Diane. Such a simple yet creative and fun idea to dress up a dinner party table. Hello, Diane! What a fabulous idea to use the earrings. My grandma has some beautiful ones…I’ll have to keep it in mind :) Have a wonderful weekend! I am speechless! So simple. So perfect. This is geneus! Thanks for sharing. I’m going to get on your followers list now. Love, love this idea. I might have to steal…oh, I mean borrow this idea. :) Cute blog! Diane- Hello, and thanks for stopping at my blog and leaving such kind comments. I just had to visit back. I am so happy that you started blogging! Your blog is lovely and your ideas so very creative. I can’t see where I could follow you- because you have the kind of posts I so enjoy! Creative and with “STYLE”. Please stop by again, we could be great blogging friends! Enjoy decorating tomorrow- what a great job! If you have a follow button and I missed it let me know!